Liczba stron: 308 Jest to ujednolicona liczba stron, która ułatwi Ci porównanie długości książek. Każda strona Legimi to 200 słów. 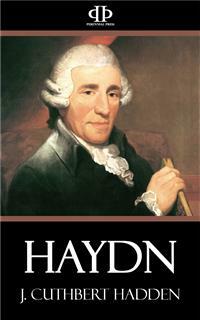 The authority for Haydn's life is the biography begun by the late Dr Pohl, and completed after his death by E.V. Mandyczewski. To this work, as yet untranslated, every subsequent writer is necessarily indebted, and the present volume, which I may fairly claim to be the fullest life of Haydn that has so far appeared in English, is largely based upon Pohl. I am also under obligations to Miss Pauline D. Townsend, the author of the monograph in the "Great Musicians" series. For the rest, I trust I have acquainted myself with all the more important references made to Haydn in contemporary records and in the writings of those who knew him. Finally, I have endeavoured to tell the story of his career simply and directly, to give a clear picture of the man, and to discuss the composer without trenching on the ground of the formalist. INTRODUCTORY—ROHRAU—A POOR HOME—GENEALOGY—HAYDN’S PARENTS—HIS BIRTH—HIS Precocity—Informal Music-making—His First Teacher—Hainburg—"A Regular Little Urchin"—Attacks the Drum—A Piece of Good Luck—A Musical Examination—Goes to Vienna—Choir School of St Stephen’s—A House of Suffering—Lessons at the Cathedral—A Sixteen-Part Mass—Juvenile Escapades—"Sang like a Crow"—Dismissed from the Choir. Haydn’s position, alike in music and in musical biography, is almost unique. With the doubtful exception of Sebastian Bach, no composer of the first rank ever enjoyed a more tranquil career. Bach was not once outside his native Germany; Haydn left Austria only to make those visits to England which had so important an influence on the later manifestations of his genius: His was a long, sane, sound, and on the whole, fortunate existence. For many years he was poor and obscure, but if he had his time of trial, he never experienced a time of failure. With practical wisdom he conquered the Fates and became eminent. A hard, struggling youth merged into an easy middle-age, and late years found him in comfortable circumstances, with a solid reputation as an artist, and a solid retiring-allowance from a princely patron, whose house he had served for the better part of his working career. Like Goethe and Wordsworth, he lived out all his life. He was no Marcellus, shown for one brief moment and “withdrawn before his springtime had brought forth the fruits of summer.” His great contemporary, Mozart, cut off while yet his light was crescent, is known to posterity only by the products of his early manhood. Haydn’s sun set at the end of a long day, crowning his career with a golden splendour whose effulgence still brightens the ever-widening realm of music. Voltaire once said of Dante that his reputation was becoming greater and greater because no one ever read him. Haydn’s reputation is not of that kind. It is true that he may not appeal to what has been called the “fevered modern soul,” but there is an old-world charm about him which is specially grateful in our bustling, nerve-destroying, bilious age. He is still known as “Papa Haydn,” and the name, to use Carlyle’s phrase, is “significant of much.” In the history of the art his position is of the first importance. He was the father of instrumental music. He laid the foundations of the modern symphony and sonata, and established the basis of the modern orchestra. Without him, artistically speaking, Beethoven would have been impossible. He seems to us now a figure of a very remote past, so great have been the changes in the world of music since he lived. But his name will always be read in the golden book of classical music; and whatever the evolutionary processes of the art may bring, the time can hardly come when he will be forgotten, his works unheard. is flat and marshy. The house in which the composer was born had been built by his father. Situated at the end of the market-place, it was in frequent danger from inundation; and although it stood in Haydn’s time with nothing worse befalling it than a flooding now and again, it has twice since been swept away, first in 1813, fours years after Haydn’s death, and again in 1833. It was carefully rebuilt on each occasion, and still stands for the curious to see—a low-roofed cottage, very much as it was when the composer of “The Creation” first began to be “that various thing called man.” A fire unhappily did some damage to the building in 1899. But excepting that the picturesque thatched roof has given place to a covering of less inflammable material, the “Zum Haydn” presents its extensive frontage to the road, just as it did of yore. Our illustration shows it exactly as it is to-day. [See an interesting account of a visit to the cottage after the fire, in The Musical Times for July 1899.] Schindler relates that when Beethoven, shortly before his death, was shown a print of the cottage, sent to him by Diabelli, he remarked: “Strange that so great a man should have been born in so poor a home!” Beethoven’s relations with Haydn, as we shall see later on, were at one time somewhat strained; but the years had softened his asperity, and this indirect tribute to his brother composer may readily be accepted as a set-off to some things that the biographer of the greater genius would willingly forget. It was indeed a poor home into which Haydn had been born; but tenderness, piety, thrift and orderliness were there, and probably the happiest part of his career was that which he spent in the tiny, dim-lighted rooms within sound of Leitha’s waters. In later life, when his name had been inscribed on the roll of fame, he looked back to the cottage at Rohrau, “sweet through strange years,” with a kind of mingled pride and pathetic regret. Flattered by the great and acclaimed by the devotees of his art, he never felt ashamed of his lowly origin. On the contrary, he boasted of it. He was proud, as he said, of having “made something out of nothing.” He does not seem to have been often at Rohrau after he was launched into the world, a stripling not yet in his teens. But he retained a fond memory of his birthplace. When in 1795 he was invited to inspect a monument erected to his honour in the grounds of Castle Rohrau, he knelt down on the threshold of the old home by the market-place and kissed the ground his feet had trod in the far-away days of youth. When he came to make his will, his thoughts went back to Rohrau, and one of his bequests provided for two of its poorest orphans. Modern theories of heredity and the origin of genius find but scanty illustration in the case of Haydn. Unlike the ancestors of Bach and Beethoven and Mozart, his family, so far as the pedigrees show, had as little of genius, musical or other, in their composition, as the families of Shakespeare and Cervantes. In the male line they were hard-working, honest tradesmen, totally undistinguished even in their sober walk in life. They came originally from Hainburg, where Haydn’s great-grandfather, Kaspar, had been among the few to escape massacre when the town was stormed by the Turks in July 1683. The composer’s father, Matthias Haydn, was, like most of his brothers, a wheelwright, combining with his trade the office of parish sexton. He belonged to the better peasant class, and, though ignorant as we should now regard him, was yet not without a tincture of artistic taste. He had been to Frankfort during his “travelling years,” and had there picked up some little information of a miscellaneous kind. “He was a great lover of music by nature,” says his famous son, “and played the harp without knowing a note of music.” He had a fine tenor voice, and when the day’s toil was over he would gather his household around him and set them singing to his well-meant accompaniment. Joseph Haydn, to give the composer the name which he now usually bears, was the second of the twelve children born to the Rohrau wheelwright. The exact date of his birth is uncertain, but it was either the 31st of March or the 1st of April 1732. Haydn himself gave the latter as the correct date, alleging that his brother Michael had fixed upon the previous day to save him from being called an April fool! Probably we shall not be far off the mark if we assume with Pohl that Haydn was born in the night between the 31st of March and the 1st of April. Very few details have come down to us in regard to his earlier years; and such details as we have refer almost wholly to his musical precocity. It was not such a precocity as that of Mozart, who was playing minuets at the age of four, and writing concertos when he was five; but just on that account it is all the more credible. One’s sympathies are with the frank Philistine who pooh-poohs the tales told of baby composers, and hints that they must have been a trial to their friends. Precocious they no doubt were; but precocity often evaporates before it can become genius, leaving a sediment of disappointed hopes and vain ambitions. In literature, as Mr Andrew Lang has well observed, genius may show itself chiefly in acquisition, as in Sir Walter Scott, who, as a boy, was packing all sorts of lore into a singularly capacious mind, while doing next to nothing that was noticeable. In music it is different. Various learning is not so important as a keenly sensitive organism. The principal thing is emotion, duly ordered by the intellect, not intellect touched by emotion. Haydn’s precocity at any rate was of this sort. It proclaimed itself in a quick impressionableness to sound, a delicately-strung ear, and an acute perception of rhythm. We have seen how the father had his musical evenings with his harp and the voices of wife and children. These informal rehearsals were young Haydn’s delight. We hear more particularly of his attempts at music-making by sawing away upon a piece of stick at his father’s side, pretending to play the violin like the village schoolmaster under whom he was now learning his rudiments. The parent was hugely pleased at these manifestations of musical talent in his son. He had none of the absurd, old-world ideas of Surgeon Handel as to the degrading character of the divine art, but encouraged the youngster in every possible way. Already he dreamt—what father of a clever boy has not done the same?—that Joseph would in some way or other make the family name famous; and although it is said that like his wife, he had notions of the boy becoming a priest, he took the view that his progress towards holy orders would be helped rather than hindered by the judicious cultivation of his undoubted taste for music. While these thoughts were passing through his head, the chance visit of a relation practically decided young Haydn’s future. His grandmother, being left a widow, had married a journeyman wheelwright, Matthias Seefranz, and one of their children married a schoolmaster, Johann Matthias Frankh. Frankh combined with the post of pedagogue that of choir-regent at Hainburg, the ancestral home of the Haydns, some four leagues from Rohrau. He came occasionally to Rohrau to see his relatives, and one day he surprised Haydn keeping strict time to the family music on his improvised fiddle. Some discussion following about the boy’s unmistakable talent, the schoolmaster generously offered to take him to Hainburg that he might learn “the first elements of music and other juvenile acquirements.” The father was pleased; the mother, hesitating at first, gave her reluctant approval, and Haydn left the family home never to return, except on a flying visit. This was in 1738, when he was six years of age. The town of Hainburg lies close to the Danube, and looks very picturesque with its old walls and towers. According to the Nibelungen Lied, King Attila once spent a night in the place, and a stone figure of that “scourge of God” forms a feature of the Hainburg Wiener Thor, a rock rising abruptly from the river, crowned with the ruined Castle of Rottenstein. The town cannot be very different from what it was in Haydn’s time, except perhaps that there is now a tobacco manufactory, which gives employment to some 2000 hands. It is affecting to think of the little fellow of six dragged away from his home and his mother’s watchful care to be planted down here among strange surroundings and a strange people. That he was not very happy we might have assumed in any case. But there were, unfortunately, some things to render him more unhappy than he need have been. Frankh’s intentions were no doubt excellent; but neither in temper nor in character was he a fit guardian and instructor of youth. He got into trouble with the authorities more than once for neglect of his duties, and had to answer a charge of gambling with loaded dice. As a teacher he was of that stern disciplinarian kind which believes in lashing instruction into the pupil with the “tingling rod.” Haydn says he owed him more cuffs than gingerbread. What he owed to the schoolmaster’s wife may be inferred from the fact that she compelled him to wear a wig “for the sake of cleanliness.” All his life through Haydn was most particular about his personal appearance, and when quite an old man it pained him greatly to recall the way in which he was neglected by Frau Frankh. “I could not help perceiving,” he remarked to Dies, “much to my distress, that I was gradually getting very dirty, and though I thought a good deal of my little person, was not always able to avoid spots of dirt on my clothes, of which I was dreadfully ashamed. In fact, I was a regular little urchin.” Perhaps we should not be wrong in surmising that the old man was here reading into his childhood the habits and sentiments of his later years. Young boys of his class are not usually deeply concerned about grease spots or disheveled hair. At all events, if deplorably neglected in these personal matters, he was really making progress with his art. Under Frankh’s tuition he attained to some proficiency on the violin and the harpsichord, and his voice was so improved that, as an early biographer puts it, he was able to “sing at the parish desk in a style which spread his reputation through the canton.” Haydn himself, going back upon these days in a letter of 1779, says: “Our Almighty Father (to whom above all I owe the most profound gratitude) had endowed me with so much facility in music that even in my sixth year I was bold enough to sing some masses in the choir.” He was bold enough to attempt something vastly more ponderous. A drummer being wanted for a local procession, Haydn undertook to play the part. Unluckily, he was so small of stature that the instrument had to be carried before him on the back of a colleague! That the colleague happened to be a hunchback only made the incident more ludicrous. But Haydn had rather a partiality for the drum—a satisfying instrument, as Mr George Meredith says, because of its rotundity—and, as we shall learn when we come to his visits to London, he could handle the instrument well enough to astonish the members of Salomon’s orchestra. According to Pohl, the particular instrument upon which he performed on the occasion of the Hainburg procession is still preserved in the choir of the church there. Hard as these early years must have been, Haydn recognized in after-life that good had mingled with the ill. His master’s harshness had taught him patience and self-reliance. “I shall be grateful to Frankh as long as I live,” he said to Griesinger, “for keeping me so hard at work.” He always referred to Frankh as “my first instructor,” and, like Handel with Zachau, he acknowledged his indebtedness in a practical way by bequeathing to Frankh’s daughter, then married, 100 florins and a portrait of her father—a bequest which she missed by dying four years before the composer himself. Haydn had been two years with Frankh when an important piece of good fortune befell him. At the time of which we are writing the Court Capellmeister at Vienna was George Reutter, an inexhaustible composer of church music, whose works, now completely forgotten, once had a great vogue in all the choirs of the Imperial States. Even in 1823 Beethoven, who was to write a mass for the Emperor Francis, was recommended to adopt the style of this frilled and periwigged pedant! Reutter’s father had been for many years Capellmeister at St Stephen’s Cathedral, Vienna, and on his death, in 1738, the son succeeded to the post. He had not been long established in the office when he started on a tour of search for choristers. Arriving at Hainburg, he heard from the local pastor of Haydn’s “weak but pleasing voice,” and immediately had the young singer before him. The story of the examination is rather amusing. Reutter gave the little fellow a canon to sing at first sight. The boy went though the thing triumphantly, and the delighted Reutter cried “Bravo!” as he flung a handful of cherries into Haydn’s cap. But there was one point on which Reutter was not quite satisfied. “How is it, my little man,” he said, “that you cannot shake?” “How can you expect me to shake,” replied the enfant terrible, “when Herr Frankh himself cannot shake?” The great man was immensely tickled by the ready retort, and, drawing the child towards him, he taught him how to make the vibrations in his throat required to produce the ornament. The boy picked up the trick at once. It was the final decision of his fate. Reutter saw that here was a recruit worth having, and he lost no time in getting the parents’ sanction to carry him off to Vienna. In the father’s case this was easily managed, but the mother only yielded when it was pointed out that her son’s singing in the cathedral choir did not necessarily mean the frustration of her hopes of seeing him made a priest. Thus, some time in the year 1740, Reutter marched away from Hainburg with the little Joseph, and Hainburg knew the little Joseph no more. Vienna was now to be his home for ten long years of dreary pupilage and genteel starvation. In those days, and for long after, St Stephen’s Cathedral was described as “the first church in the empire,” and it is still, with its magnificent spire, the most important edifice in Vienna. Erected in 1258 and 1276 on the site of a church dating from 1144, it was not finally completed until 1446. It is in the form of a Latin cross, and is 355 feet long. The roof is covered with coloured tiles, and the rich groined vaulting is borne by eighteen massive pillars, adorned with more than a hundred statuettes. Since 1852 the building has been thoroughly restored, but in all essentials it remains as it was when Haydn sang in it as a choir-boy. Many interesting details have been printed regarding the Choir School of St Stephen’s and its routine in Haydn’s time. They have been well summarized by one of his biographers. [See Miss Townsend’s Haydn, p. 9.] The Cantorei was of very ancient foundation. Mention is made of it as early as 1441, and its constitution may be gathered from directions given regarding it about the period 1558-1571. It was newly constituted in 1663, and many alterations were made then and afterwards, but in Haydn’s day it was still practically what it had been for nearly a century before. The school consisted of a cantor (made Capellmeister in 1663), a sub-cantor, two ushers and six scholars. They all resided together, and had meals in common; and although ample allowance had originally been made for the board, lodging and clothing of the scholars, the increased cost of living resulted in the boys of Haydn’s time being poorly fed and scantily clad. They were instructed in “religion and Latin, together with the ordinary subjects of school education, and in music, the violin, clavier, and singing.” The younger scholars were taken in hand by those more advanced. The routine would seem to us now to be somewhat severe. There were two full choral services daily in the cathedral. Special Te Deums were constantly sung, and the boys had to take part in the numerous solemn processions of religious brotherhoods through the city, as well as in the services for royal birthdays and other such occasions. During Holy Week the labours of the choir were continuous. Children’s processions were very frequent, and Haydn’s delight in after years at the performance of the charity children in St Paul’s may have been partly owing to the reminiscences of early days which it awakened. But these details are aside from our main theme. The chapel-house of St Stephen’s was now the home of our little Joseph. It ought to have been a happy home of instruction, but it was, alas! a house of suffering. Reutter did not devote even ordinary care to his pupil, and from casual lessons in musical theory he drifted into complete neglect. Haydn afterwards declared that he had never had more than two lessons in composition from Reutter, who was, moreover, harsh and cruel and unfeeling, laughing at his pupil’s groping attempts, and chastising him on the slightest pretext. It has been hinted that the Capellmeister was jealous of his young charge—that he was “afraid of finding a rival in the pupil.” But this is highly improbable. Haydn had not as yet shown any unusual gifts likely to excite the envy of his superior. There is more probability in the other suggestion that Reutter was piqued at not having been allowed by Haydn’s father to perpetuate the boy’s fine voice by the ancient method of emasculation. The point, in any case, is not of very much importance. It is sufficient to observe that Reutter’s name survives mainly in virtue of the fact that he tempted Haydn to Vienna with the promise of special instruction, and gave him practically nothing of that, but a great deal of ill-usage. It is pathetic to think of the boy assiduously scratching innumerable notes on scraps of music paper, striving with yet imperfect knowledge to express himself, and hoping that by some miracle of inspiration something like music might come out of it. “I thought it must be all right if the paper was nice and full,” he said. He even went the length of trying to write a mass in sixteen parts—an effort which Reutter rewarded with a shrug and a sneer, and the sarcastic suggestion that for the present two parts might be deemed sufficient, and that he had better perfect his copying of music before trying to compose it. But Haydn was not to be snubbed and snuffed out in this way. He appealed to his father for money to buy some theory books. There was not too much money at Rohrau, we may be sure, for the family was always increasing, and petty economies were necessary. But the wheelwright managed to send the boy six florins, and that sum was immediately expended on Fux’s Gradus ad Parnassum and Mattheson’s Volkommener Capellmeister—heavy, dry treatises both, which have long since gone to the musical antiquary’s top shelf among the dust and the cobwebs. These “dull and verbose dampers to enthusiasm” Haydn made his constant companions, in default of a living instructor, and, like Longfellow’s “great men,” toiled upwards in the night, while less industrious mortals snored. Meanwhile his native exuberance and cheerfulness of soul were irrepressible. Several stories are told of the schoolboy escapades he enjoyed with his fellow choristers. One will suffice here. He used to boast that he had sung with success at Court as well as in St Stephen’s. This meant that he had made one of the choir when visits were paid to the Palace of Schonbrunn, where the Empress Maria and her Court resided. On the occasion of one of these visits the palace was in the hands of the builders, and the scaffolding presented the usual temptation to the youngsters. “The empress,” to quote Pohl, “had caught them climbing it many a time, but her threats and prohibitions had no effect. One day when Haydn was balancing himself aloft, far above his schoolfellows, the empress saw him from the windows, and requested her Hofcompositor to take care that ‘that fair-headed blockhead,’ the ringleader of them all, got ‘einen recenten Schilling’ (slang for ‘a good hiding’).” The command was only too willingly obeyed by the obsequious Reutter, who by this time had been ennobled, and rejoiced in the addition of “von” to his name. Many years afterwards, when the empress was on a visit to Prince Esterhazy, the “fair-headed blockhead” took the cruel delight of thanking her for this rather questionable mark of Imperial favour! As a matter of fact, the empress, however she may have thought of Haydn the man, showed herself anything but considerate to Haydn the choir-boy. The future composer’s younger brother, Michael, had now arrived in Vienna, and had been admitted to the St Stephen’s choir. His voice is said to have been “stronger and of better quality” than Joseph’s, which had almost reached the “breaking” stage; and the empress, complaining to Reutter that Joseph “sang like a crow,” the complacent choirmaster put Michael in his place. The empress was so pleased with the change that she personally complimented Michael, and made him a present of 24 ducats. One thing leads to another. Reutter, it is obvious, did not like Haydn, and any opportunity of playing toady to the empress was too good to be lost. Unfortunately Haydn himself provided the opportunity. Having become possessed of a new pair of scissors, he was itching to try their quality. The pig-tail of the chorister sitting before him offered an irresistible attraction; one snip and lo! the plaited hair lay at his feet. Discipline must be maintained; and Reutter sentenced the culprit to be caned on the hand. This was too great an indignity for poor Joseph, by this time a youth of seventeen—old enough, one would have thought, to have forsworn such boyish mischief. He declared that he would rather leave the cathedral service than submit. “You shall certainly leave,” retorted the Capellmeister, “but you must be caned first.” And so, having received his caning, Haydn was sent adrift on the streets of Vienna, a broken-voiced chorister, without a coin in his pocket, and with only poverty staring him in the face. This was in November 1749. VIENNA—THE FORLORN EX-CHORISTER—A GOOD SAMARITAN—HAYDN Enskied—Street Serenades—Joins a Pilgrim Party—An Unconditional Loan—"Attic” Studies—An Early Composition—Metastasio—A Noble Pupil—Porpora—Menial Duties—Emanuel Bach—Haydn his Disciple—Violin Studies—Attempts at “Programme” Music—First Opera—An Aristocratic Appointment—Taken for an Impostor—A Count’s Capellmeister—Falls in Love—Marries—His Wife. The Vienna into which Haydn was thus cast, a friendless and forlorn youth of seventeen, was not materially different from the Vienna of to-day. While the composer was still living, one who had made his acquaintance wrote of the city: “Represent to yourself an assemblage of palaces and very neat houses, inhabited by the most opulent families of one of the greatest monarchies in Europe—by the only noblemen to whom that title may still be with justice applied. The women here are attractive; a brilliant complexion adorns an elegant form; the natural but sometimes languishing and tiresome air of the ladies of the north of Germany is mingled with a little coquetry and address, the effect of the presence of a numerous Court...In a word, pleasure has taken possession of every heart.” This was written when Haydn was old and famous; it might have been written when his name was yet unknown. Vienna was essentially a city of pleasure—a city inhabited by “a proud and wealthy nobility, a prosperous middle class, and a silent, if not contented, lower class.” In 1768, Leopold Mozart, the father of the composer, declared that the Viennese public had no love of anything serious or sensible; “they cannot even understand it, and their theatres furnish abundant proof that nothing but utter trash, such as dances, burlesques, harlequinades, ghost tricks, and devils’ antics will go down with them.” There is, no doubt, a touch of exaggeration in all this, but it is sufficiently near the truth to let us understand the kind of attention which the disgraced chorister of St Stephen’s was likely to receive from the musical world of Vienna. It was Vienna, we may recall, which dumped Mozart into a pauper’s grave, and omitted even to mark the spot. Young Haydn, then, was wandering, weary and perplexed, through its streets, with threadbare clothes on his back and nothing in his purse. There was absolutely no one to whom he could think of turning. He might, indeed, have taken the road to Rohrau and been sure of a warm welcome from his humble parents there. But there were good reasons why he should not make himself a burden on them; and, moreover, he probably feared that at home he would run some risk of being tempted to abandon his cherished profession. Frau Haydn had not yet given up the hope of seeing her boy made a priest, and though we have no definite information that Haydn himself felt a decided aversion to taking orders, it is evident that he was disinclined to hazard the danger of domestic pressure. He had now finally made up his mind that he would be a composer; but he saw clearly enough that, for the present, he must work, and work, too, not for fame, but for bread. Musing on these things while still parading the streets, tired and hungry, he met one Spangler, a tenor singer of his acquaintance, who earned a pittance at the Church of St Michael. Spangler was a poor man—but it is ever the poor who are most helpful to each other—and, taking pity on the dejected outcast, he invited Haydn to share his garret rooms along with his wife and child. It is regrettable that nothing more is known of this good Samaritan—one of those obscure benefactors who go through the world doing little acts of kindness, never perhaps even suspecting how far-reaching will be the results. He must have died before Haydn, otherwise his name would certainly have appeared in his will. Haydn remained with Spangler in that “ghastly garret” all through the winter of 1749-1750. He has been commiserated on the garret—needlessly, to be sure. Garrets are famous, in literary annals at any rate; and is it not Leigh Hunt who reminds us that the top story is healthier than the basement? The poor poet in Pope, who lay high in Drury Lane, “lull’d by soft zephyrs through the broken pane,” found profit, doubtless, in his “neighbourhood with the stars.” However that may be, there, in Spangler’s attic, was Haydn enskied, eager for work—work of any kind, so long as it had fellowship with music and brought him the bare means of subsistence. he sought any and every means of making money. He tried to get teaching, with what success has not been recorded. He sang in choirs, played at balls and weddings and baptisms, made “arrangements” for anybody who would employ him, and in short drudged very much as Wagner did at the outset of his tempestuous career. He even took part in street serenades by playing the violin. This last was not a very dignified occupation; but it is important to remember that serenading in Vienna was not the lover’s business of Italy and Spain, where the singer is accompanied by guitar or mandoline. It was a much more serious entertainment. It dated from the seventeenth century, if we are to trust Praetorius, and consisted of solos and concerted vocal music in various forms, accompanied sometimes by full orchestra and sometimes by wind instruments alone. Great composers occasionally honoured their patrons and friends with the serenade; and composers who hoped to be great found it advantageous as a means of gaining a hearing for their works. It proved of some real service to Haydn later on, but in the meantime it does not appear to have swelled his lean purse. With all his industry he fell into the direst straits now and again, and was more than once driven into wild projects by sheer stress of hunger.